I’ve already set the scene and shared my favorite frolicking adventures, but now it’s time for my favorite: the food. Having spent the past two years living in Southeast Asia, I’ve eaten a lot of good food, but I have to say, the food in Laos is some of my favorite. Hanoi has some good go-to food options (namely bún đậu and chả cá) but by and large food in Hanoi can be a bit lacking in punch. 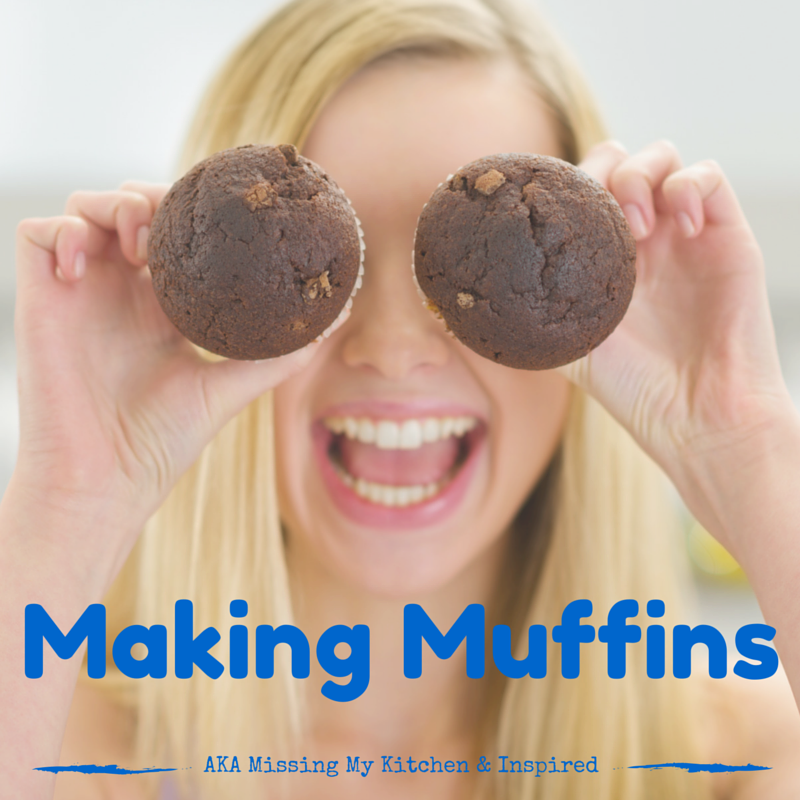 I’m a spicy kind of girl – I like my food to have a little kick. And after 18 million nem ran (spring rolls), I was ready for something different. Best snack? The crispy, sesame coated Mekong River Weed. Frankly, I’d rather not think about the source of this delicious snack. But suffice it to say, it’s similar to a crispy seawood, lightly fried then sprinkled with sesame seeds and a dash of spicy goodness. And you can dip it in an array of tasty dips (jeow). Best staple? Sticky rice. White or brown – both delicious. And cooked in beautiful handmade baskets – it’s like opening a little gift every time you sit down to a meal. Appropriate for early morning alms-giving to the monks and pairs great with just about everything. 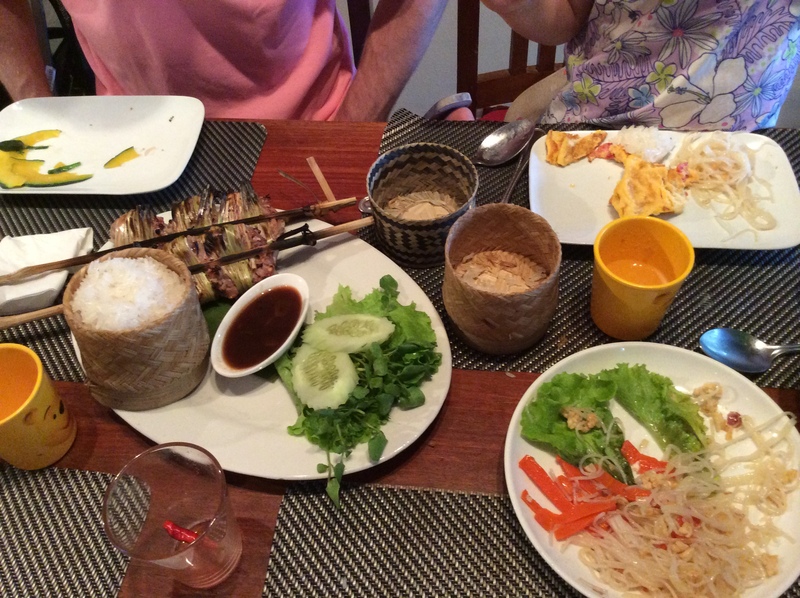 My husband’s favorite main accompaniment: lemongrass stuffed with seasoned pork or chicken. Best drink? The awesome fruit shakes sold from the stands near the night market. And, of course, Lao Dark beer. Lots of Lao Dark Beer. 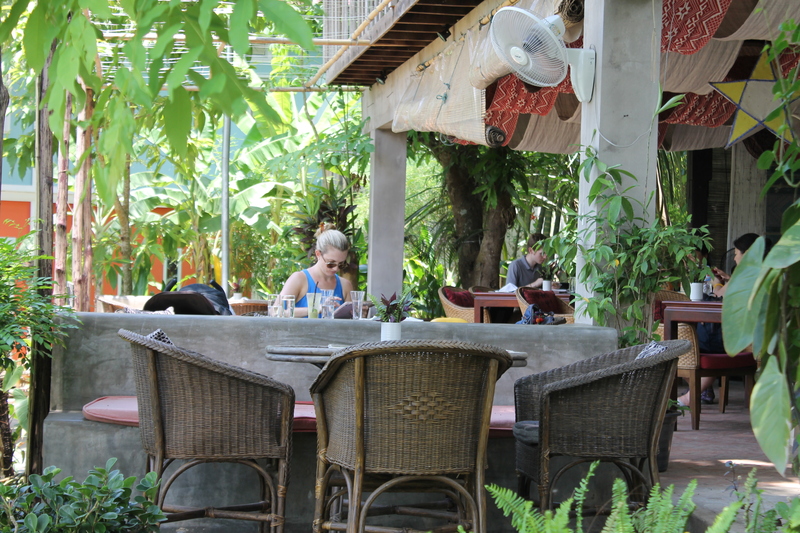 Our first stop was a return trip to the Coconut Garden, sister restaurant of L’Elephant–a beautiful, tasty, but less kid-friendly spot. We’d eaten at Coconut Garden twice on our last trip and had loved the chill, outdoor garden vibe and mix of local and western food options. This meal was the highlight of the trip. We got there early in order to avoid ruining others’ meals with our loud children. 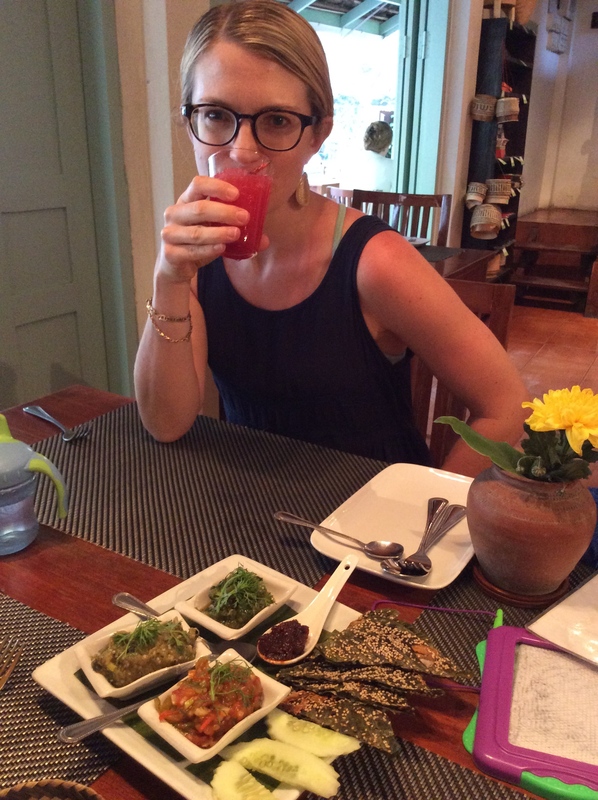 The TripAdvisor recommendations were great and highlights were the watermelon chilli granita aperitif, Laos sampler, stir-fried pumpkin, and lemongrass skewers. Bonus? Great gourmet Laos goodies to bring home, like coconut tamarind spread, ginger tea, and chilli salt. Don’t miss this delightful oasis a few miles outside of town. On the banks of the Mekong, with freshly died silk blowing in the breeze, you can’t beat the vibe. I had the Living Land Salad – lettuce with beetroot, apple, pumpkin seeds, goat cheese, and a creamy balsamic dressing. It was delicious and definitely not something I’d find in Hanoi. The Lao Dark was delicious (as always), as was the post-meal cappuccino. My daughter and I stumbled across this gem of a cafe as we were trying to escape the heat. What a find! Cute cafe vibe with good coffees, smoothies, and an extensive menu that includes lots of veggie and vegan options. A good sandwich can be hard to come by in Southeast Asia and I was pleased to enjoy a veggie sandwich on good, fresh bread. The cafe is on the bottom floor of a hotel of the same name, and attached to an adorable store. I found a cute, reasonably priced locally made indigo pillow case and this awesome hat ($3!). Don’t miss this off-the-beaten path restaurant. 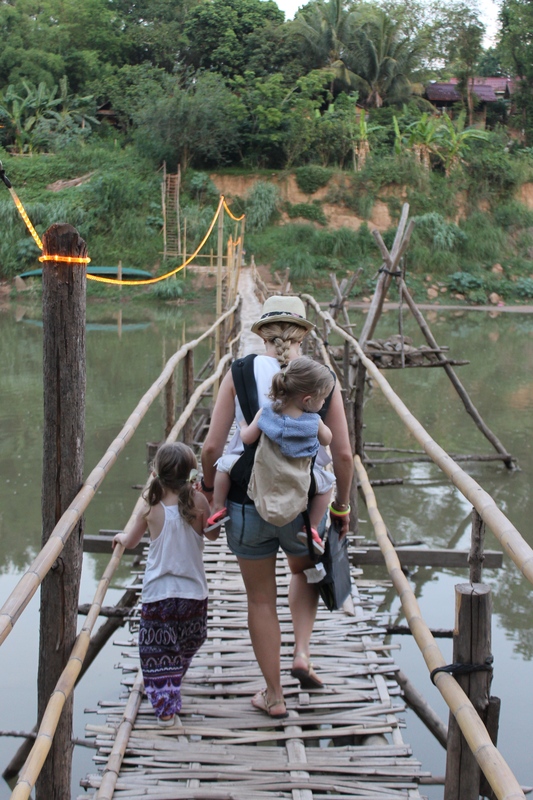 And by off-the-beaten-path, I mean you have to cross the Nam Khan River via a creaky bamboo suspension bridge (see photos below). 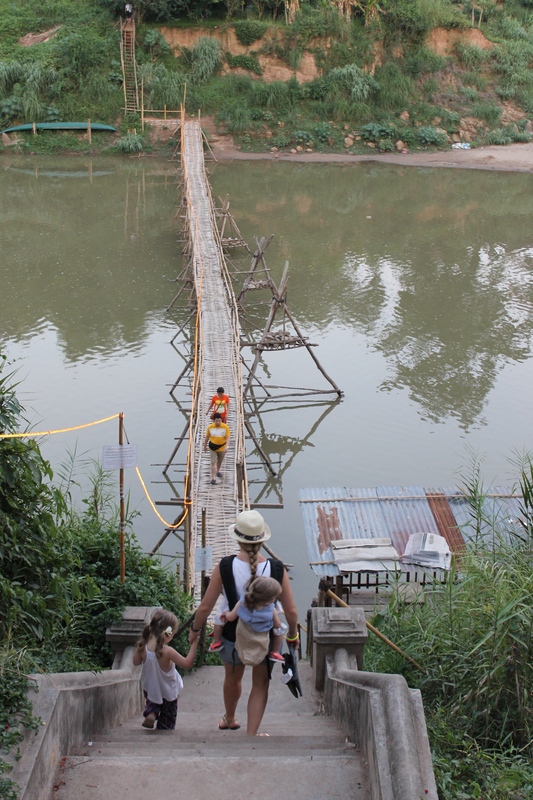 Once you cross the bridge and climb the steep staircase to the top of the river bank, walk about 1/4 mile and you’ll find Pizza Phan Luang on the left hand side, down a narrow corridor. You’ll be pleasantly surprised to find a quaint garden pizza cafe, complete with a wood fire pizza oven, romantic candles, and relaxed outdoor vibe. The pizza was the best I’ve had in Southeast Asia (although, admittedly, this ain’t Manhattan).